A tremendous amount of media coverage and a lot of hyperbole surrounds the emerging issues around autonomous (i.e., driverless) vehicles. Supposedly, they are about to engulf our streets and cities and change everything. 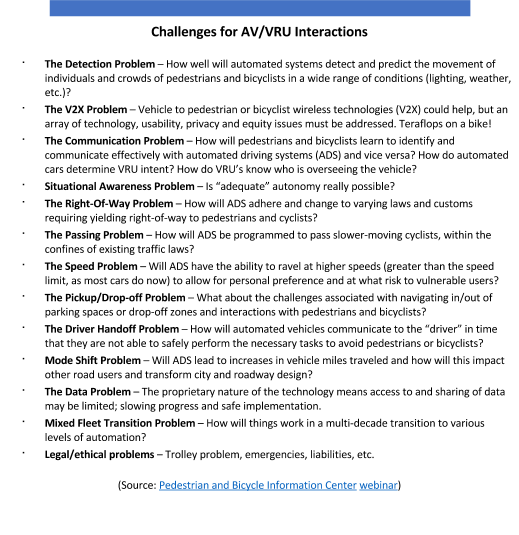 Cutting through some of the hype, the Pedestrian and Bicycle Information Center (PBIC) recently held a two-part webinar well worth a view. 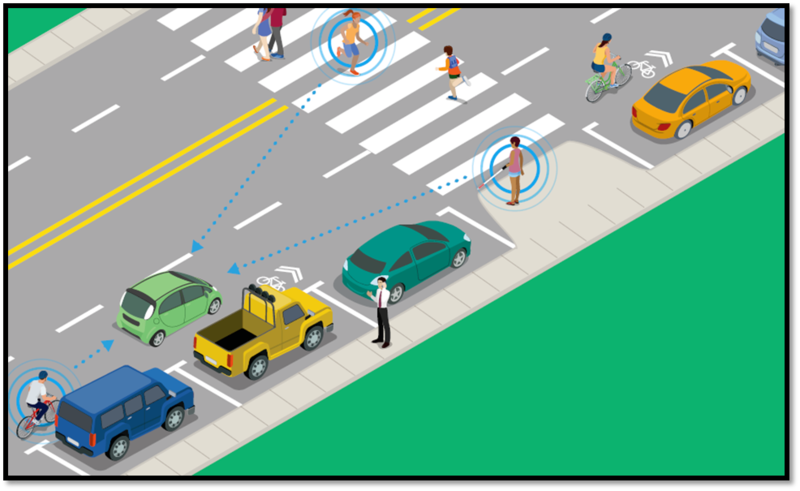 In addition, PBIC has developed a very informative companion Discussion Guide* to help advocates when talking to planners and policy makers about autonomous vehicles (AV) and vulnerable road user (VRU) issues. The first (and for me the most interesting) session featured experts from Carnegie Mellon’s Robotics Institute (Bernardo Pires), Virginia Tech Transportation Institute Center for Vulnerable Road User Safety (Justin Owens), and Charles River Analytics (Michael Jenkins). They pointed out that current technologies have a very difficult time detecting cyclists. Not surprisingly, very little R&D has yet to focus on walking and biking issues. A list of all the challenges they outlined is shown below. The second session discussed policy issues and tools. Presentations included the National Association of City Transportation Officials (NACTO), academics from UC-Davis’s National Center for Sustainable Transportation, practitioners from Sam Schwartz Engineering, and those leading the Portland, OR Smart Autonomous Vehicles Initiative (SAVI). Bicycle advocates could and should play an important role in the ongoing public and institutional dialog. We should insist on prioritizing areas of AV/pedestrian and bicycle interaction that need addressing and improvement, but we need to be invited to the table (see Dave Cieslewicz’s post on the Bike Fed blog). I came away from the webinars (still) strongly convinced, like many others, that full scale, level 5 (full automation everywhere under all conditions) autonomous vehicle implementation is still at least a decade, probably much more away. However, we may very well see trial implementations on selected restricted access roads (freeways) and more controlled environments (like the University Campus) way before then. The City of Madison has joined the Transportation for America’s Smart Cities Collaborative and will be involved in a number of projects including a Park Street transportation corridor which will explore the technology to allow signals to communicate with buses, autos and eventually pedestrians and bicyclists. The National Association of City Transportation Officials (NACTO) conference, have released a Blueprint for Autonomous Urbanism encouraging cities to set a vision to make their cities safe and livable with autonomous vehicles. Lastly, the November 7th issue of the New York Times Magazine is chock full of articles (lighthearted and serious) devoted to issues surrounding autonomous vehicles.